Dualstream 1 is a 3-phase measurement solution for allocation or monitoring gas condensate wells. It is typically used on a per well basis at the wellhead or in the flow line. Standard field instrumentation makes Dualstream 1 ideally suited to remote wellheads or unmanned platforms. 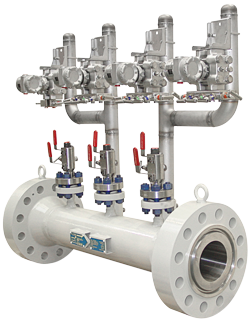 Common applications include tie-ins to existing infrastructure or new field development where real time high accuracy gas measurement is a fundamental operator requirement and water measurement accuracy is required for efficient well operation. Dualstream 1 replaces the need for test separators or tracer dilution techniques.